I must admit I have a certain fascination for lighthouses. I haven’t photographed many, but whenever I see one, I get a feeling of safety. Their function is to guide the seafarers and to warn about dangerous coastlines, leading the way to safe ports. I have a childhood memory about lighthouses. There was one quite some distance from where I grew up, but when there was fog I remember laying in bed at night, hearing the faint sound of the foghorn at the lighthouse. It was a very comforting sound. 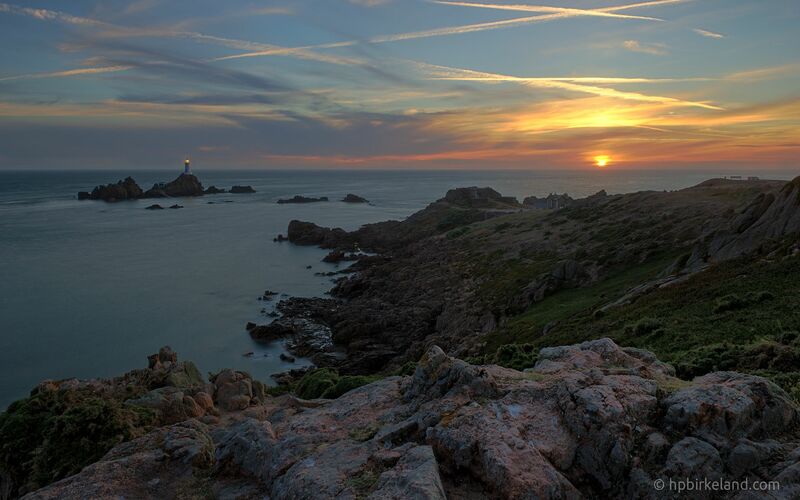 Anyway, this summer I was in Jersey, Channel Islands, and I got several chances to photograph La Corbière Lighthouse. This lighthouse is situated in the South West corner of the island, on some rocks a bit off the coast. At low tide it is actually possible to walk all the way out there on a causeway, but there is no access to the lighthouse itself. Always expect a lot of people with cameras, especially at low tide and around sunset. The thing with Jersey is the extreme difference between high and low tide, normally around eight or nine meters! This means that the whole landscape is constantly changing, and you get a lot more opportunities to get nice pictures. At low tide a completely new landscape is uncovered, and when the relation between the tide and the sun is changing every day, oh my! I highly recommend keeping track of the tide times, for example with an app like My Tide Times.